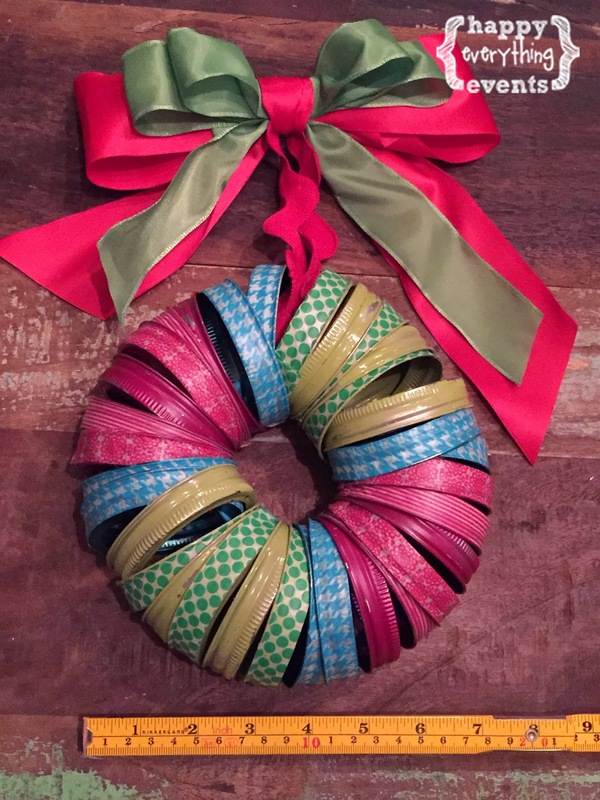 Mason Jar Lid Wreaths-- For Sale NOW in the Shop! 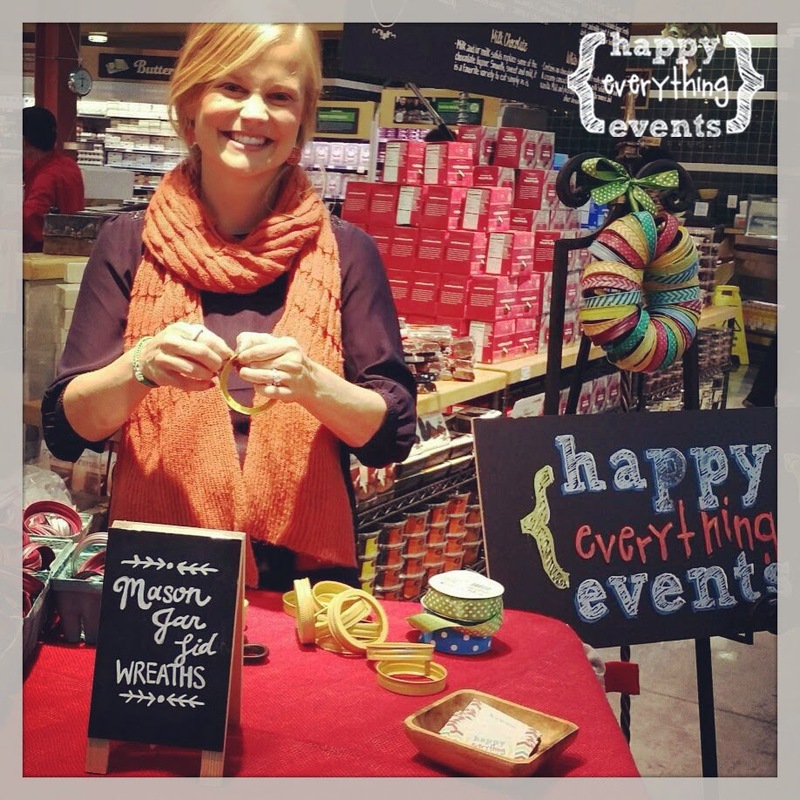 This holiday season, Happy Everything Events worked with Whole Foods Markets in Silver Spring, MD and Arlington, VA to help decorate their stores for the holidays. 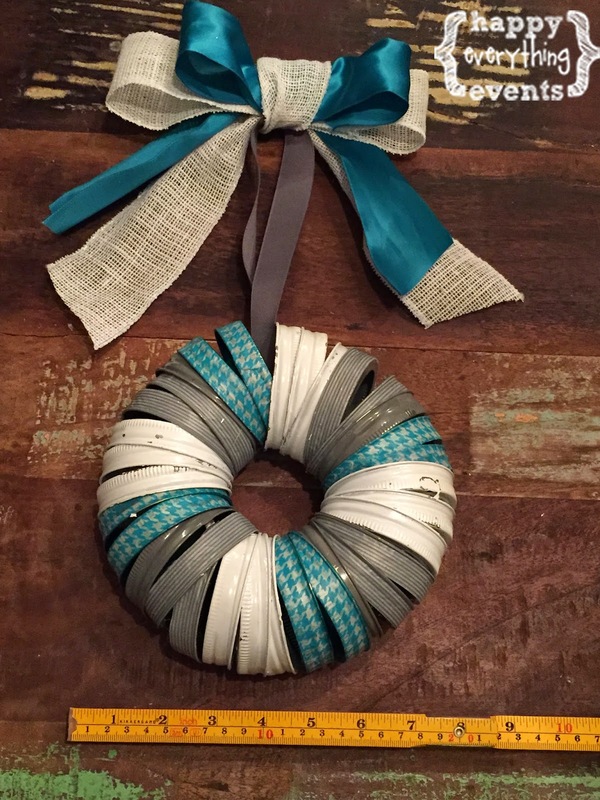 The unique element we introduced was the Mason Jar Lid Wreath. 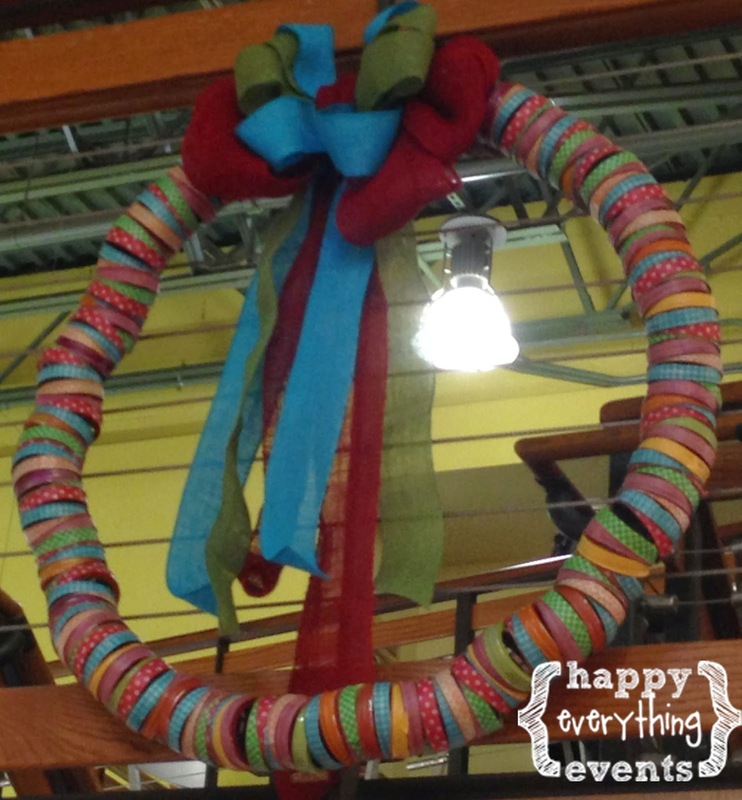 In November, Lindy did a demo in the Whole Foods Silver Spring store, showing customers how to make this fun wreath for the holidays. 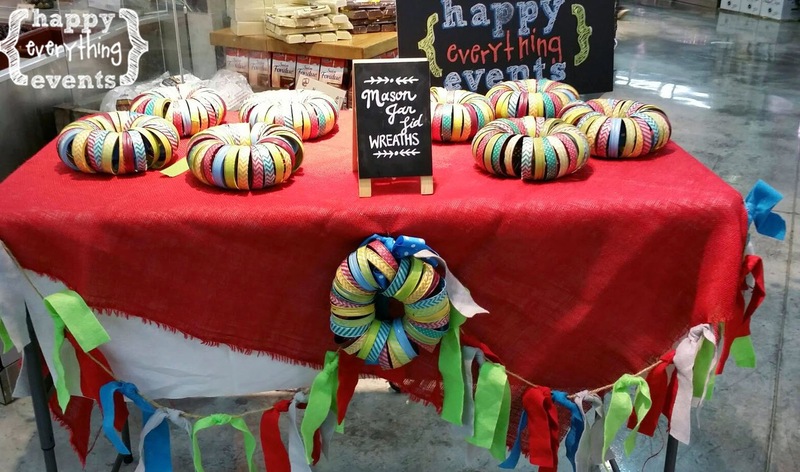 Check out the adorable wreaths throughout the Silver Spring Whole Foods. They'll be up all holiday season. 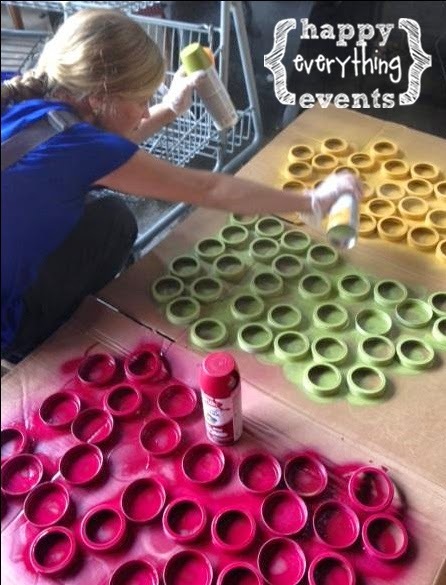 At the Arlington Whole Foods, they asked Lindy to create an extra large mason jar lid wreath to be displayed in the store. 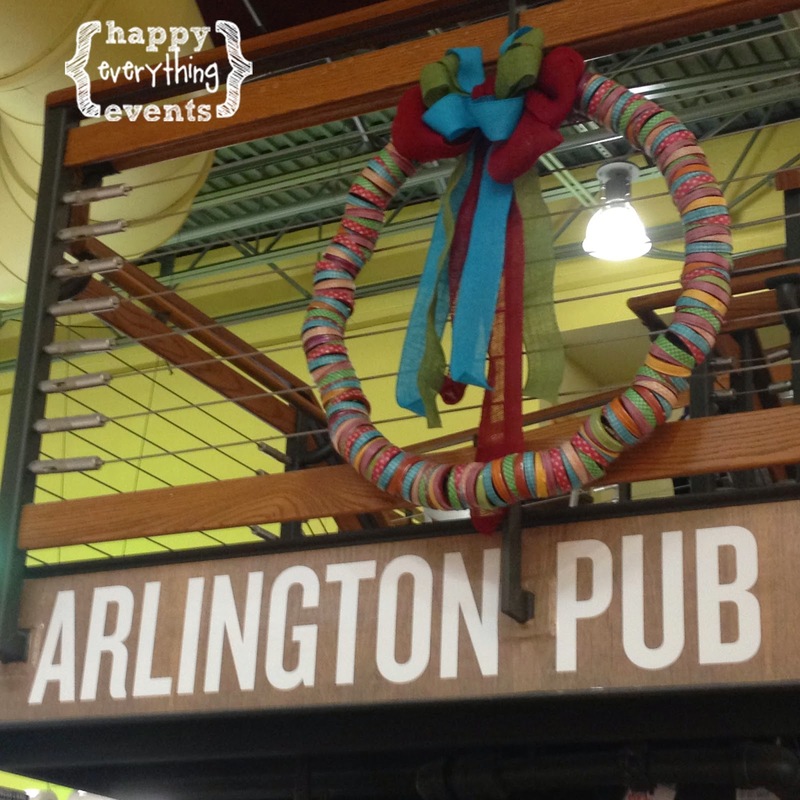 This 30" wreath is hung on the stairs landing, above the Arlington Pub and can be seen by customers as they make their way to the check out line. 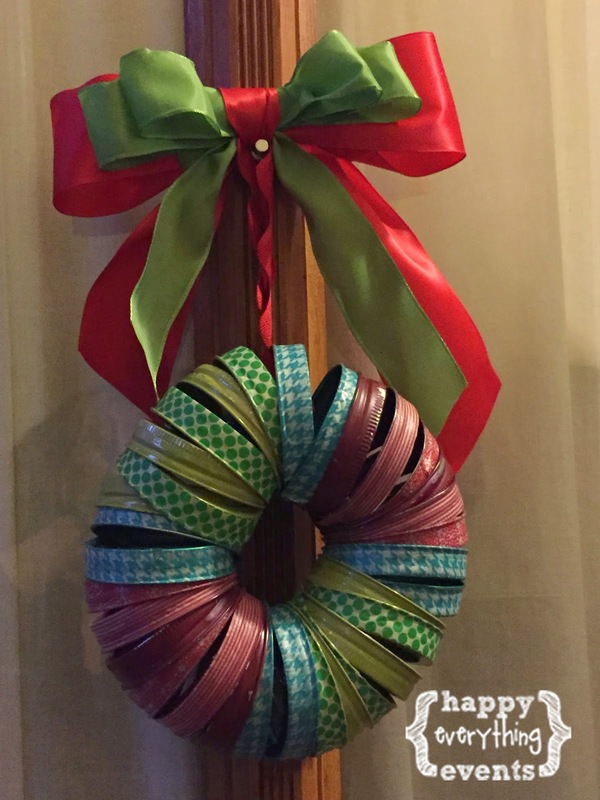 Now, we are offering a HOLIDAY EXCLUSIVE on the mason jar lid wreath in our shop! 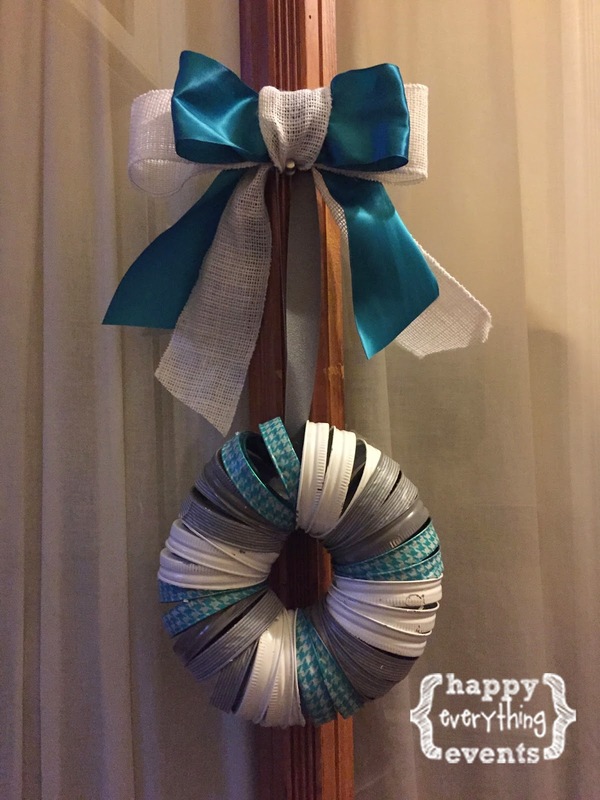 This wreath will be perfect for your upcoming holiday party or to display all holiday season long. 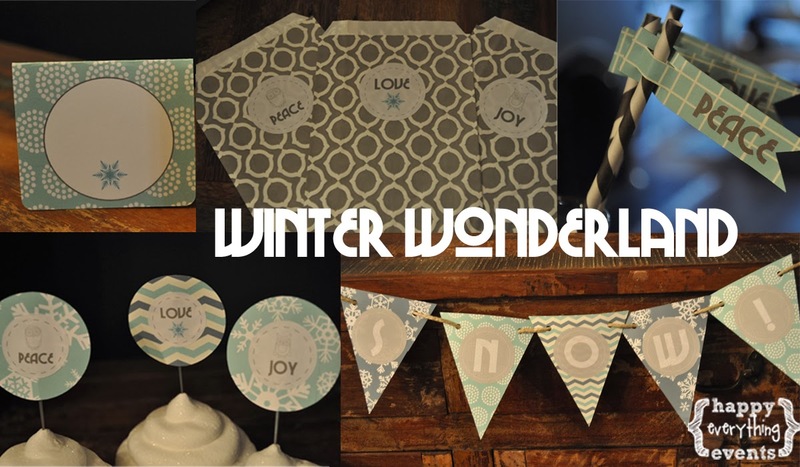 or Winter Wonderland (grey, white and blue). 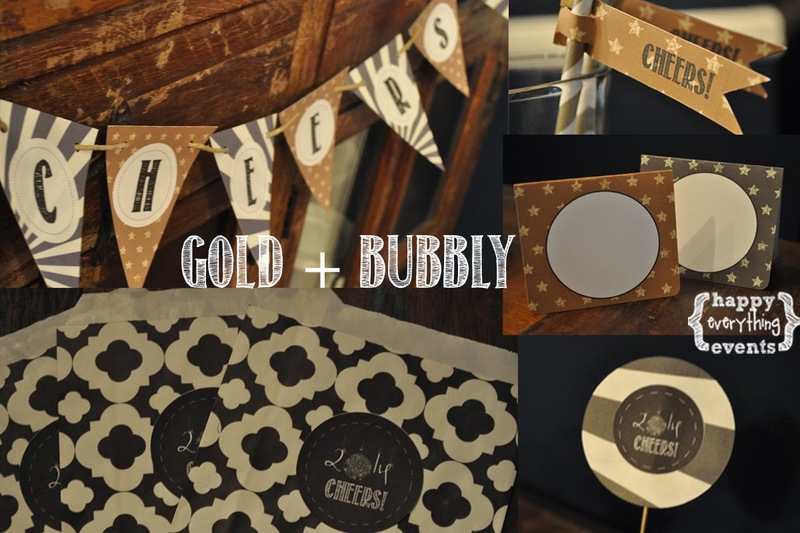 Throwing a holiday party this year? 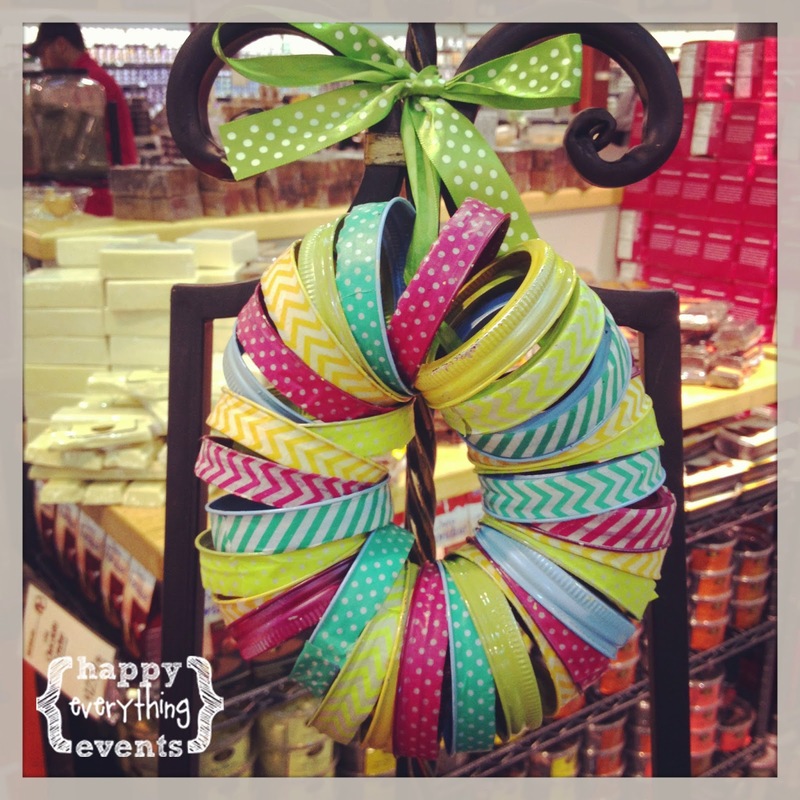 Check out the matching holiday party boxes in the shop to perfectly match these fun wreaths. 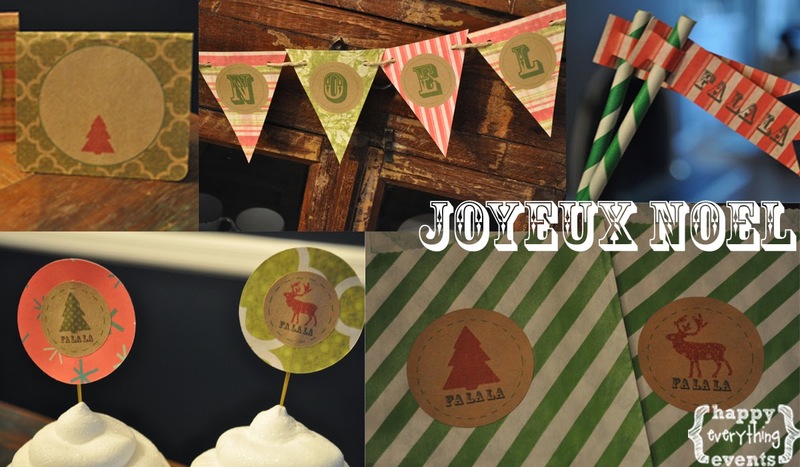 Holiday Party Boxes on sale NOW! The Holiday Party Boxes are here and ready for your upcoming holiday party! Visit our shop to get yours today! 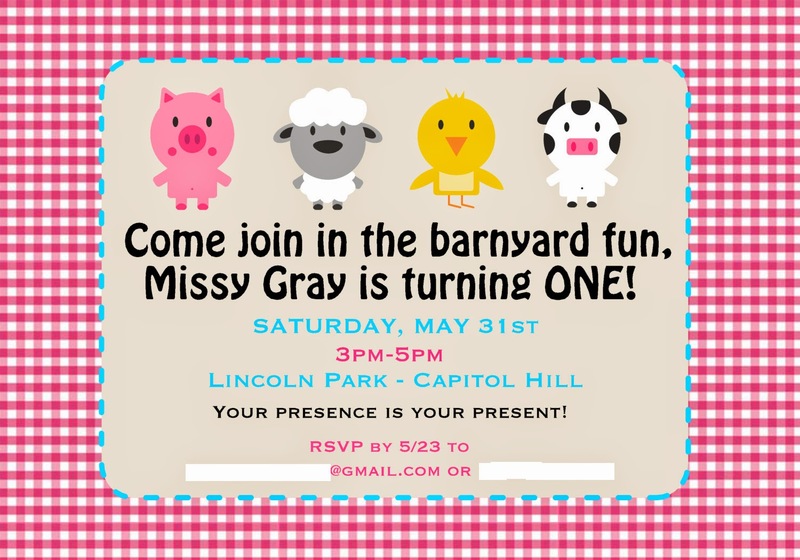 Missy Gray's Barnyard Birthday Bash! 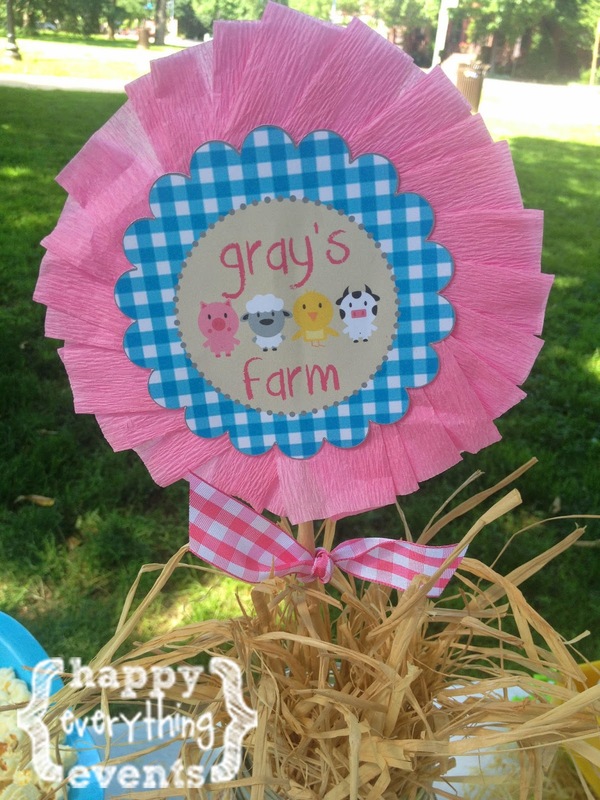 One of Little Miss Gray's favorite toys is her barnyard tractor, so it was natural that Mommy Landy wanted a Barnyard Birthday theme for her little girl's 1st birthday party. 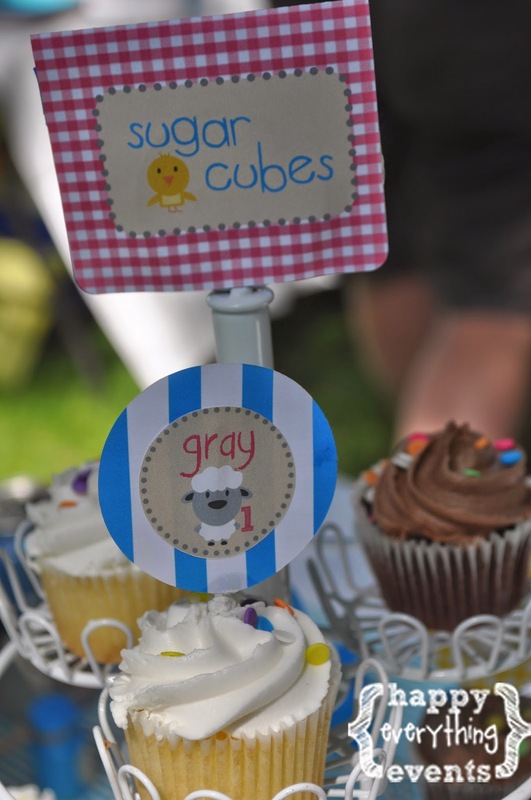 We were thrilled to be part of this special day at Lincoln Park in DC on Saturday, where her fun toy was a great centerpiece for this picnic party. 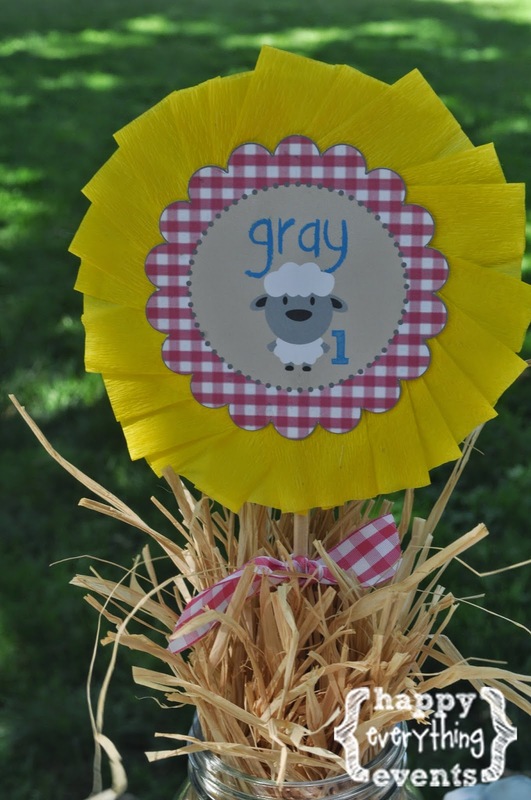 The invitations set the tone for the party with guests and incorporated gingham. We loved the fun, bright colors of pink, aqua, yellow and green! 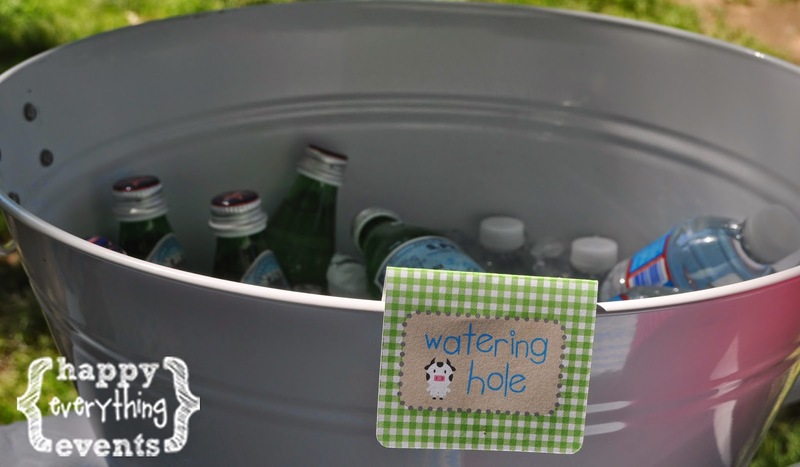 Guests enjoyed sodas, beers and waters from the "watering hole." These bubbles were a perfect favor for a perfect day in the park! 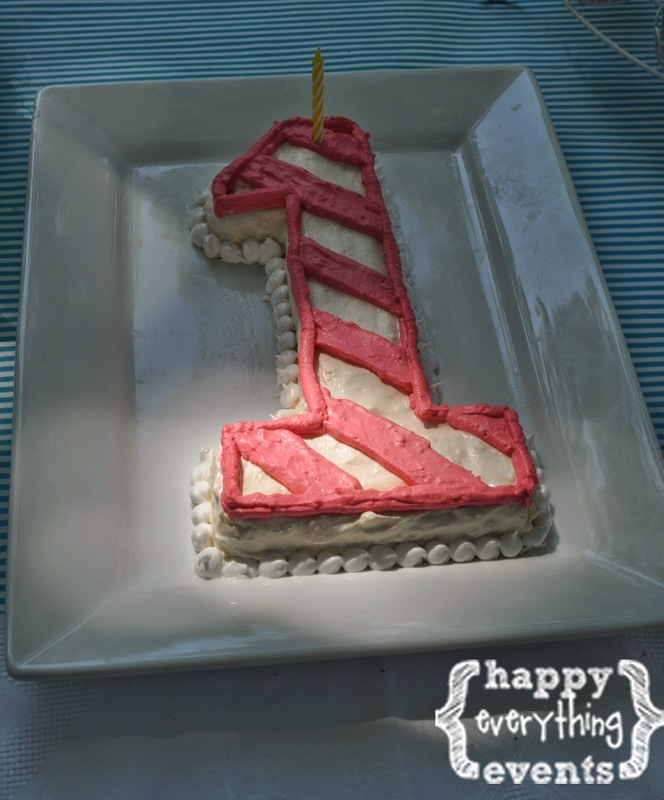 Mommy Landy's baking skills were stellar and this "1" cake is simply adorable! 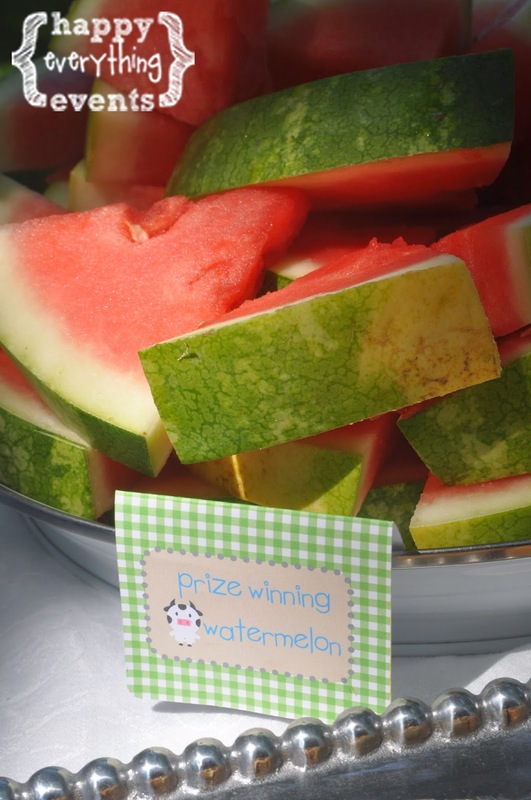 The gingham food labels helped guests get into the theme. 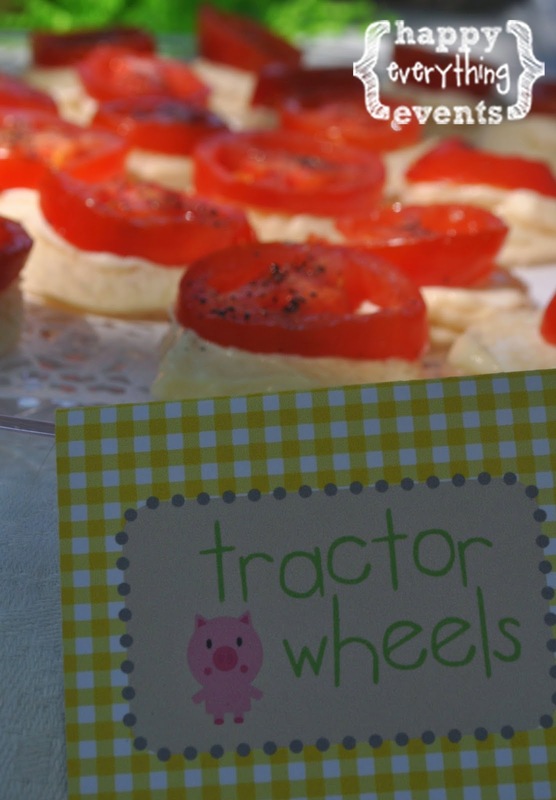 The centerpiece sticks incorporated hay and mason jars to stick with the theme. 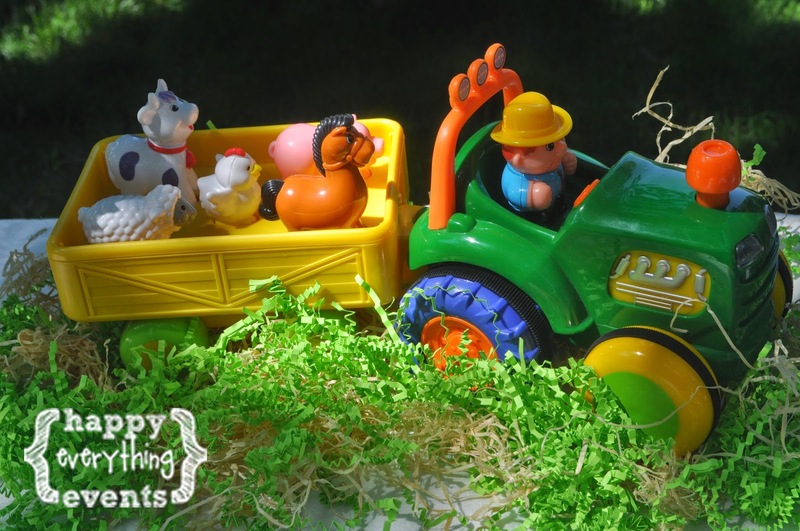 Grandma brought the Radio Flyer that Mommy Landy and her brother used to ride in when they were little so the birthday girl and her friends could go on "hay rides" around the park! 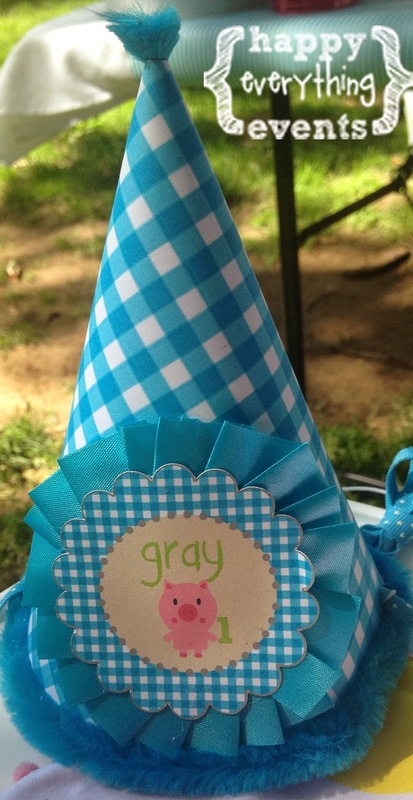 The extra special aqua party hat was a perfect addition to this fun party. 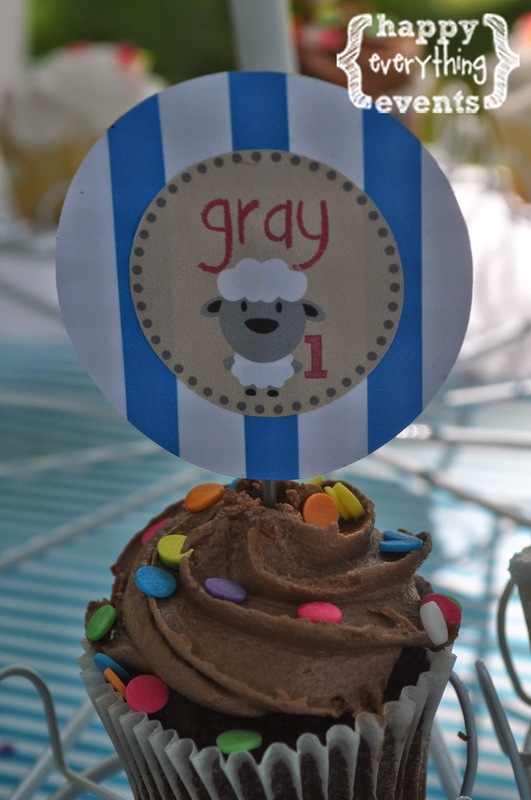 The brightly colored cupcakes were adorned with matching cupcake toppers featuring "Gray" and some of her favorite barnyard animals. 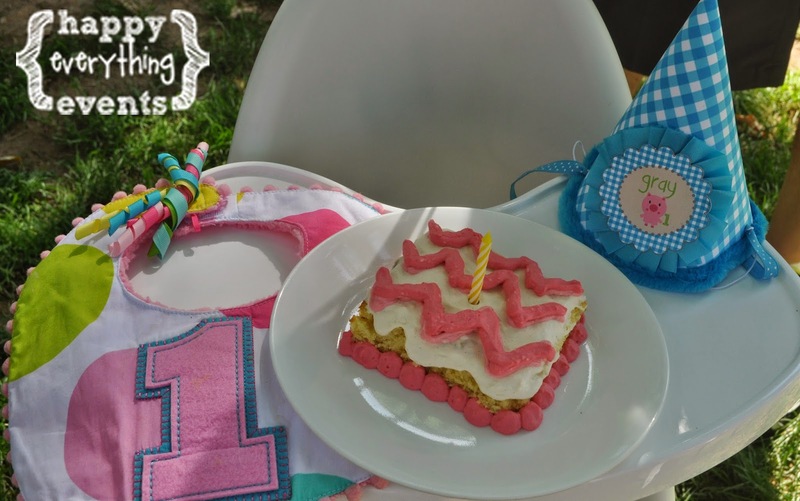 This adorable chevron smash cake was also made by Mommy Landy. 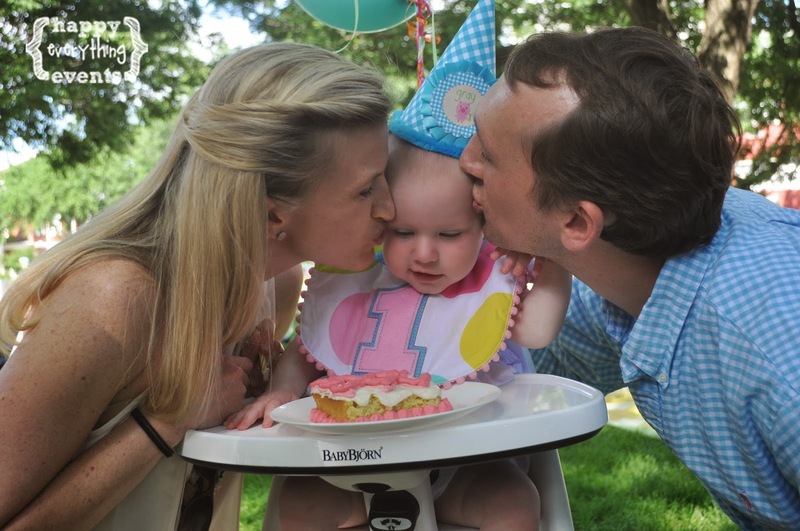 Proud parents kiss the birthday girl as she tastes her birthday cake! Interested in a similar party? Let me know. 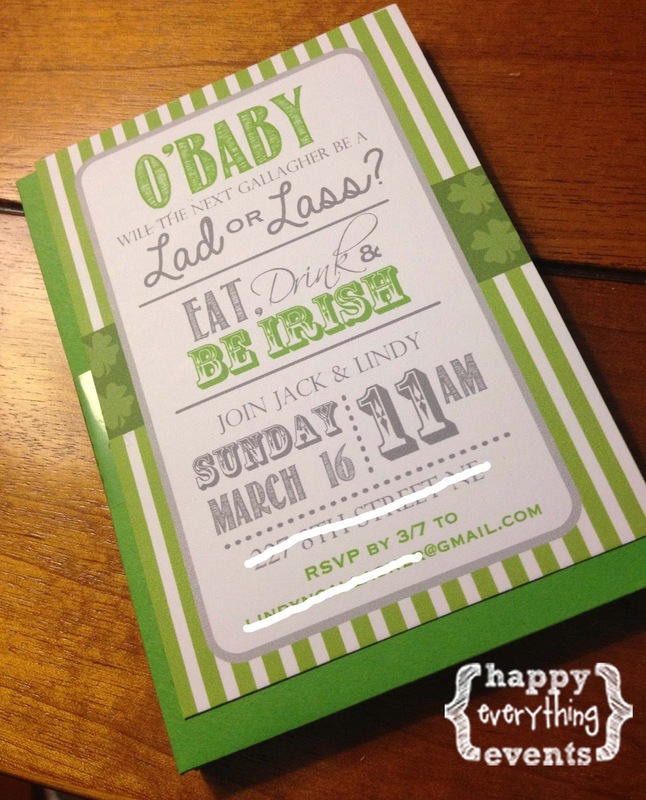 Gallagher Gender Reveal- A St. Patrick's Day Party! 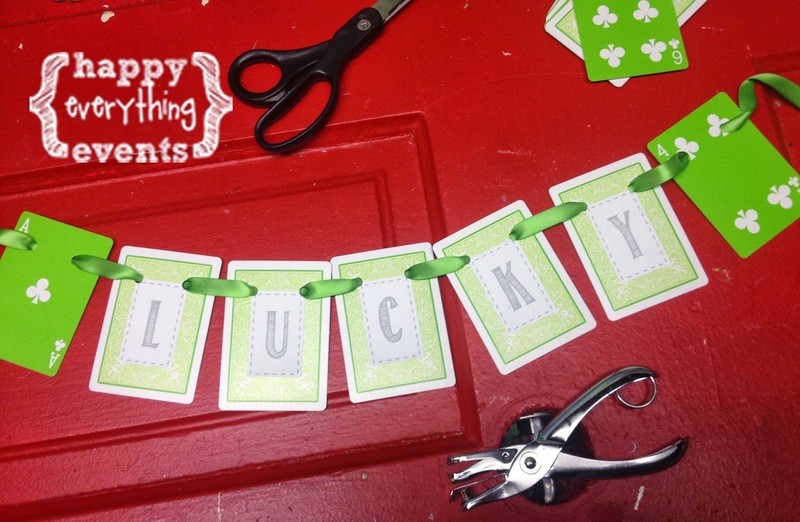 When my husband and I found out we were pregnant, "Lucky" is certainly the first word that came to mind for us. 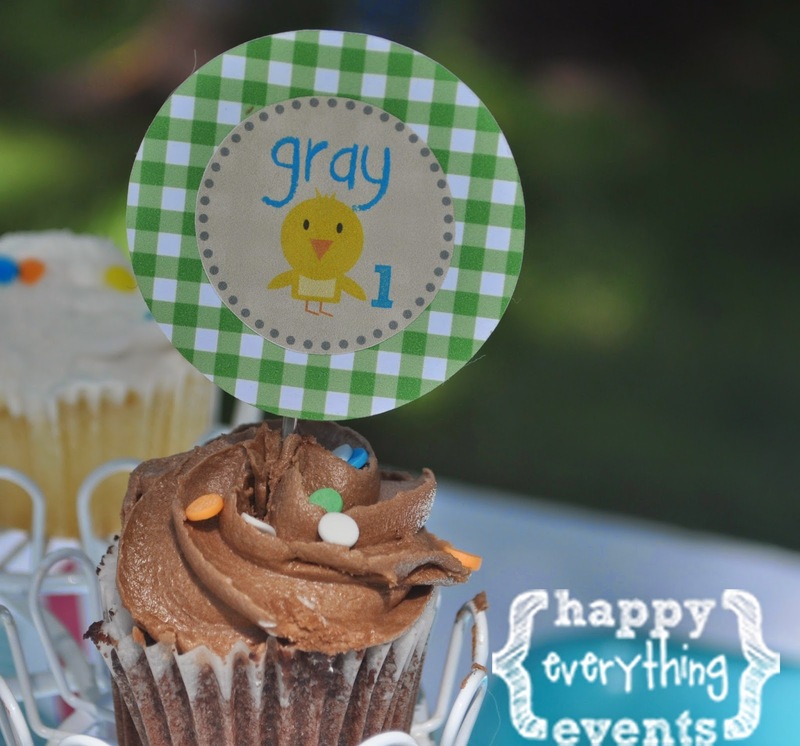 So, when it came time to determine the gender of our little one, it only seemed fitting for us to have a St. Patrick's Day themed party to learn this special news, surrounded by our friends and family. (Please click the link "Lucky" to hear this song by my friend Kat and to have great accompaniment while reading this post). It all began with this envelope and its contents. 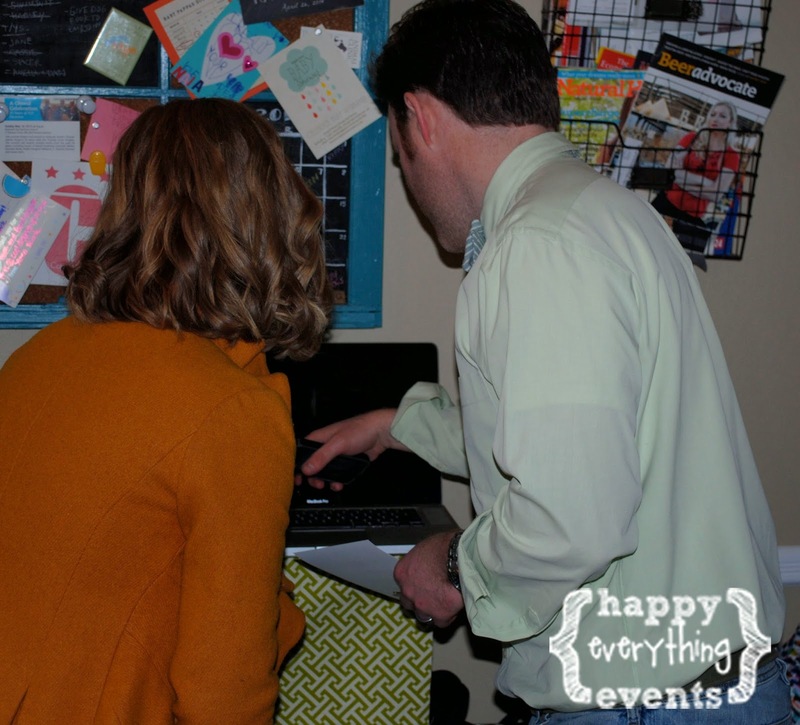 Our ultrasound technician wrote down our baby's gender in this envelope and we had Stephanie, the receptionist at our midwife's office email Katie, who created some special scratch-off cards for us for the party. (More on that later). After we got home, I made Jack hide this envelope as I knew I'd be tempted to peek. 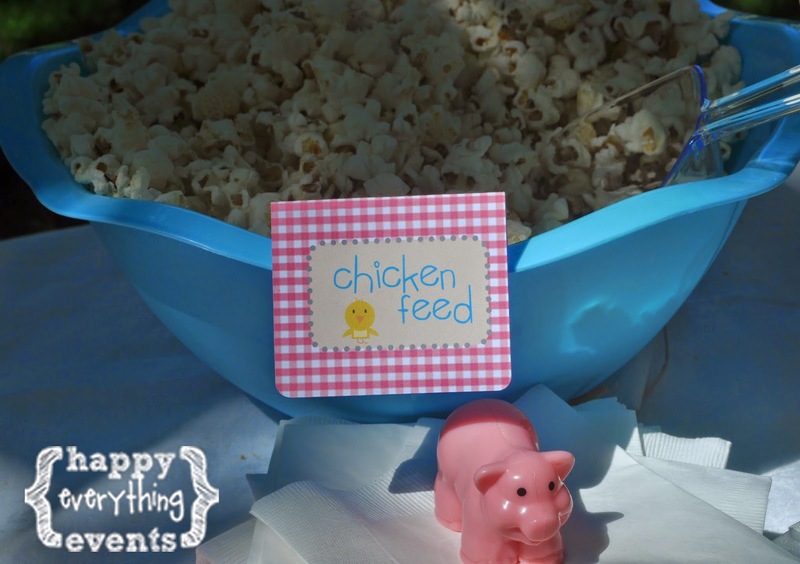 After the special scratch-off cards arrived, I put together several "Gender Reveal Party Boxes" for our immediate family, who all live far away and planned to Skype into the party. 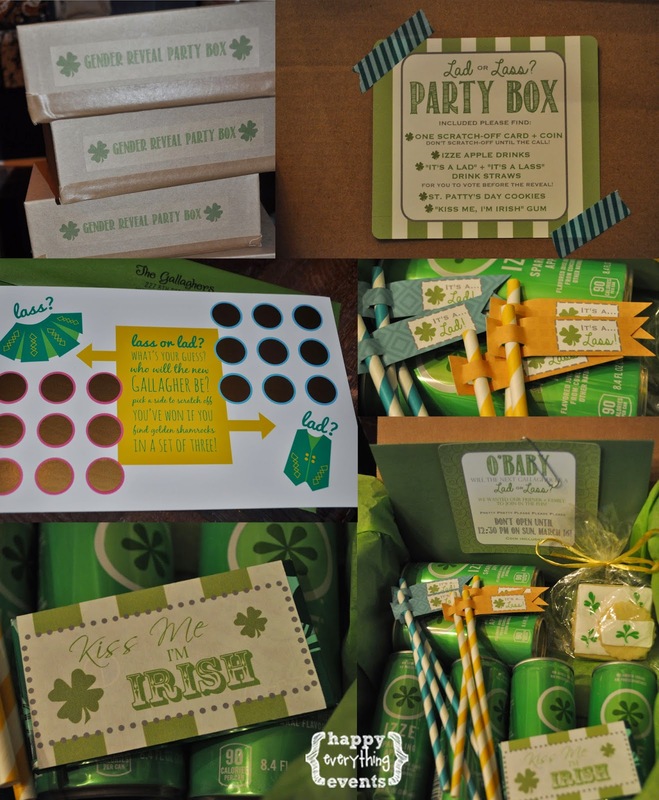 The contents of the party box: one scratch-off card and coin, IZZE apple drinks, "It's a Lad" and "It's a Lass" drink straws for them to vote for their guess during the party, St. Patty's day sugar cookies (by the fabulous Stacy Winick), and "Kiss Me, I'm Irish" gum. I got these in the mail about a week before the party so that they all arrived in time. 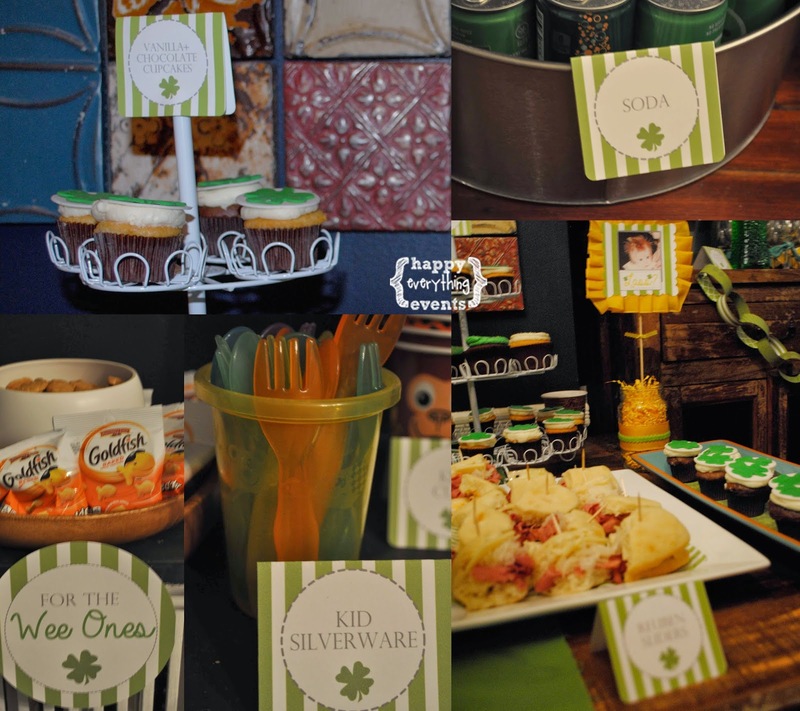 Then, on the 16th, we had our DC friends and family come to our home to "Eat, Drink and Be Irish" with us. This "Lad or Lass?" banner was made of green playing cards, which I thought played on the "Lucky" theme. (You may also notice our "Gallagher" letterpress letters on our mantle). 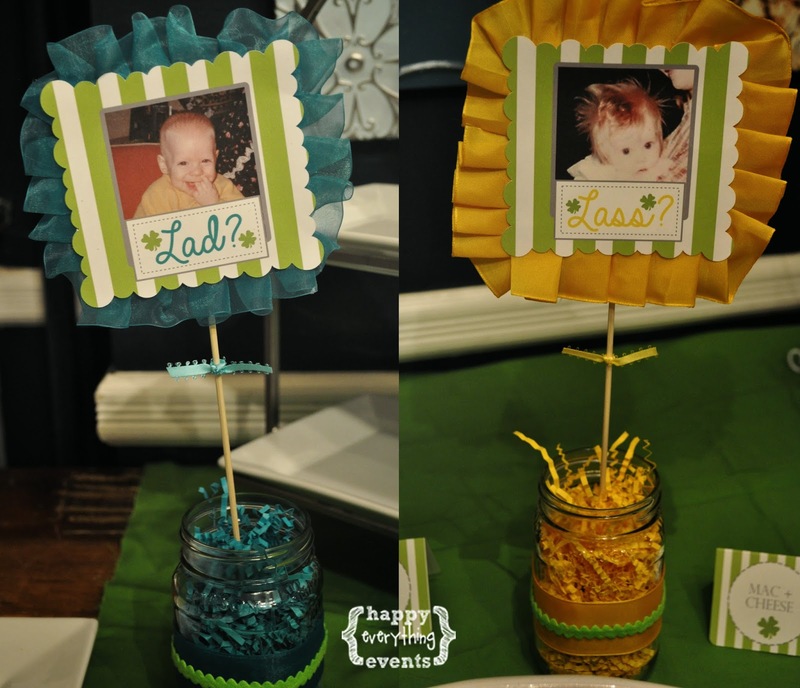 To have a little fun, I found old baby pics of Jack and me and incorporated them into the decor. 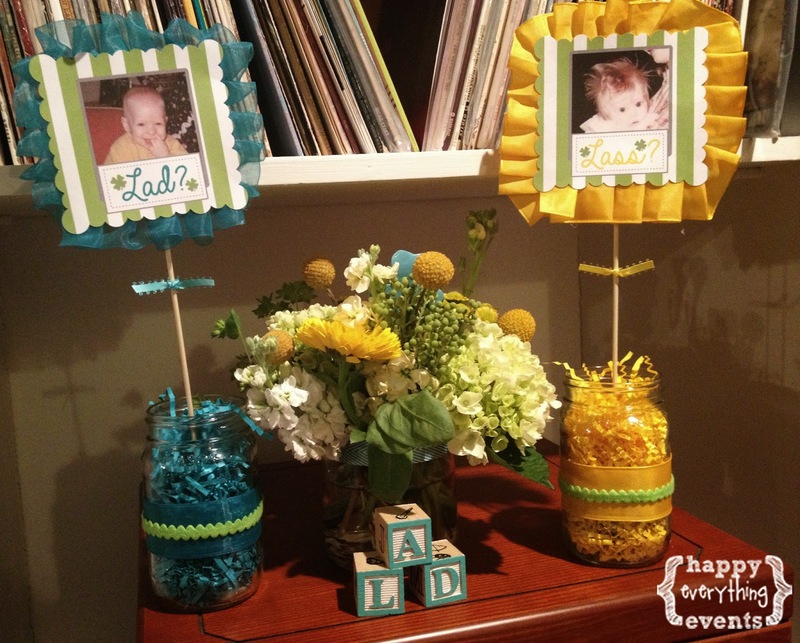 In addition to the lime green, I tied teal blue and mustard yellow into the color scheme (no pink for this girl). 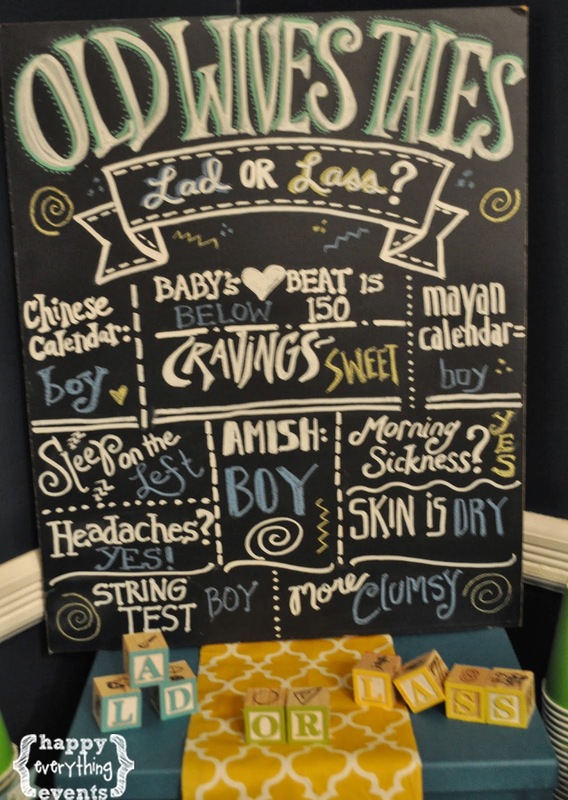 As we were getting closer to the reveal, Jack and I tested some "Old Wives Tales" to see what the experts said about what gender we would have. 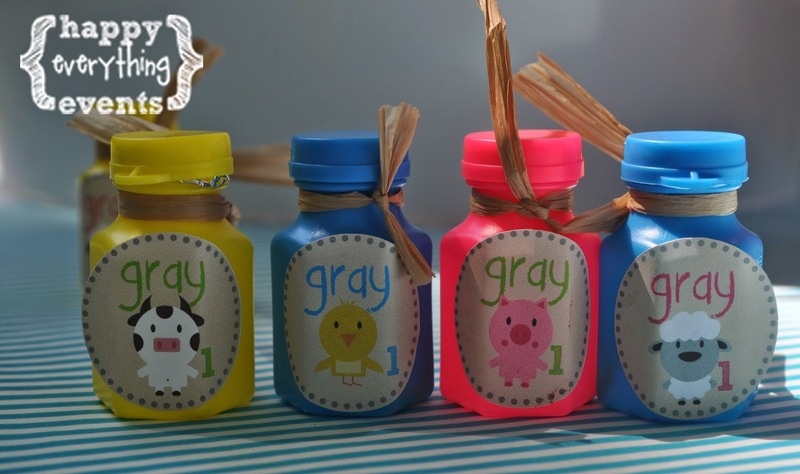 The blue answers favored boy and the yellow answers favored girl. 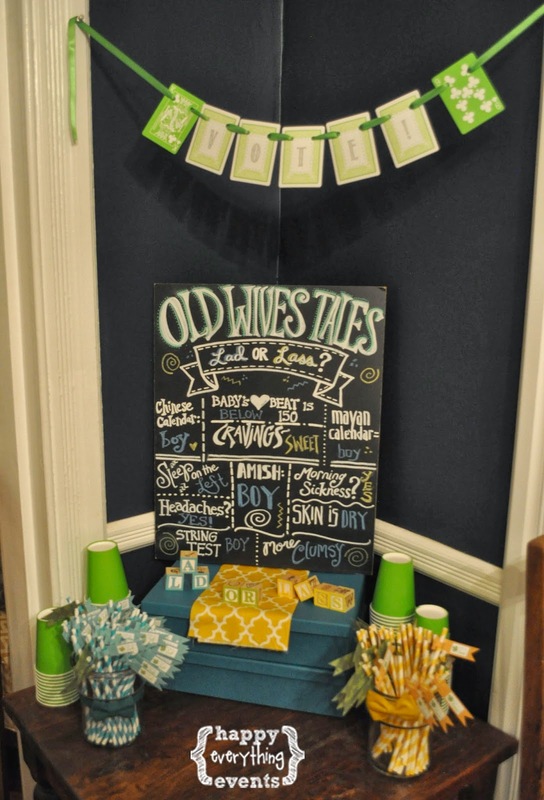 This chalkboard centerpiece was drawn by hand (Stay tuned to see if they were right!). 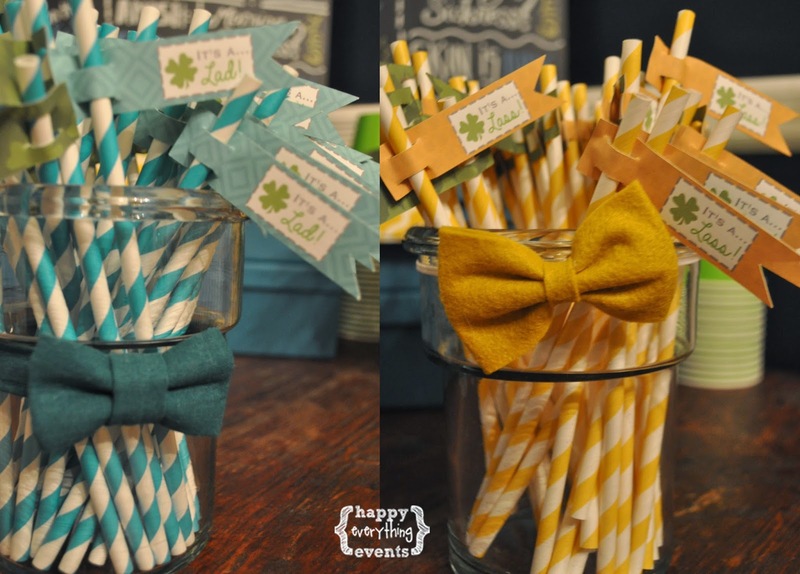 Guests "voted" by choosing a Lad or Lass drink straw. 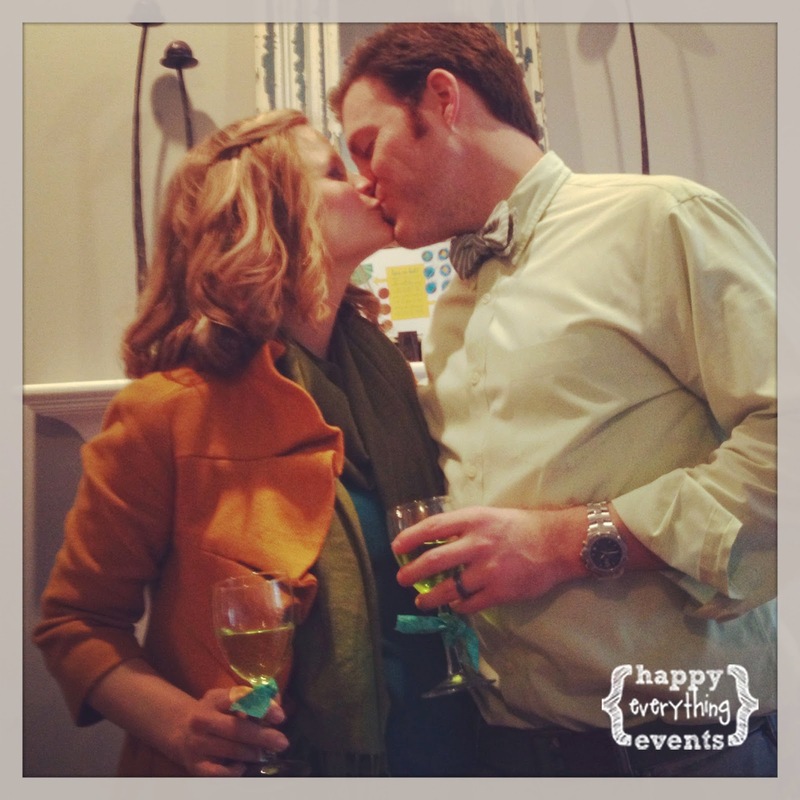 The teal bow-tie and mustard hair bow were purchased from two etsy shops. (Click on the links to see the shops). 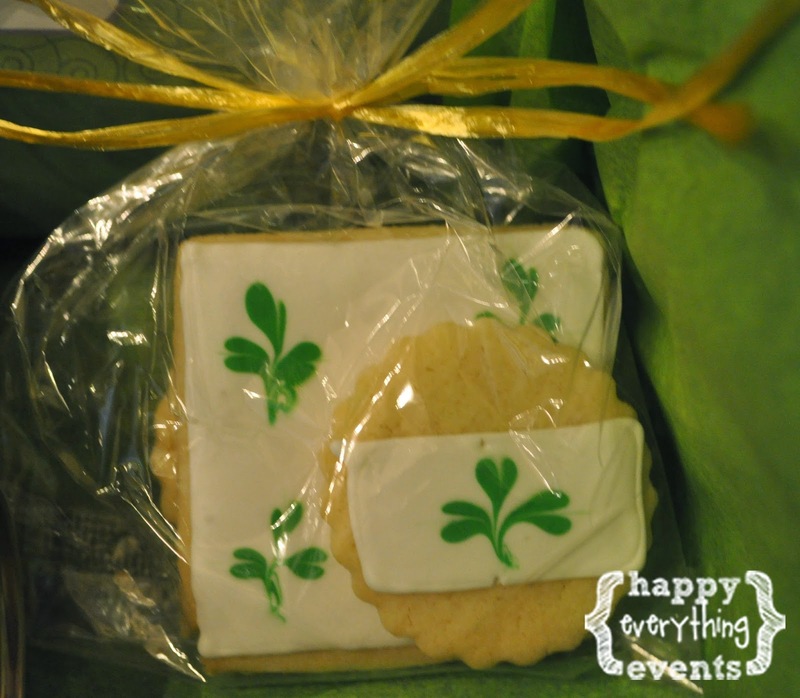 These gorgeous St. Patrick's Day themed cookies were designed and baked by the talented local baker Stacy Winick. 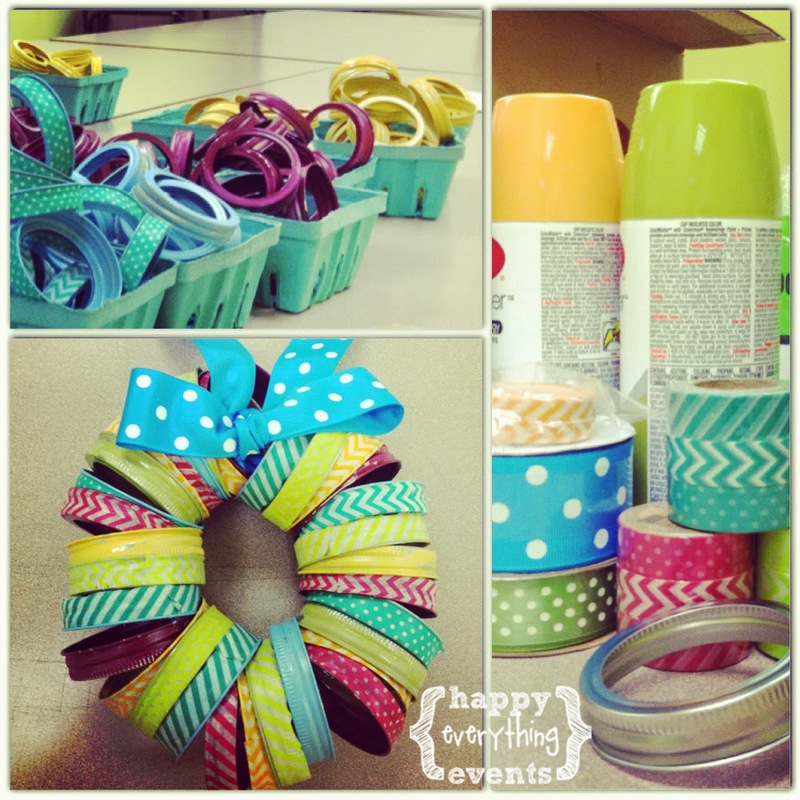 She even coordinated the ribbons in mustard and teal, too. 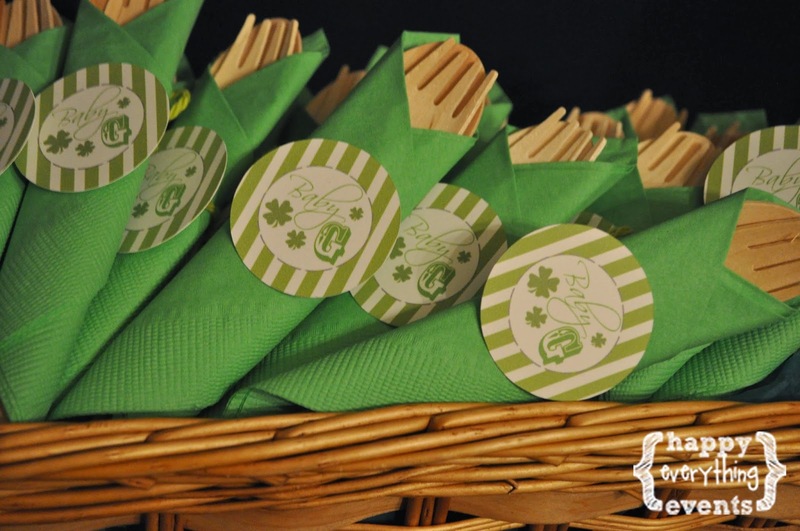 As favors, guests were given the cookies with a note "Lucky Us! 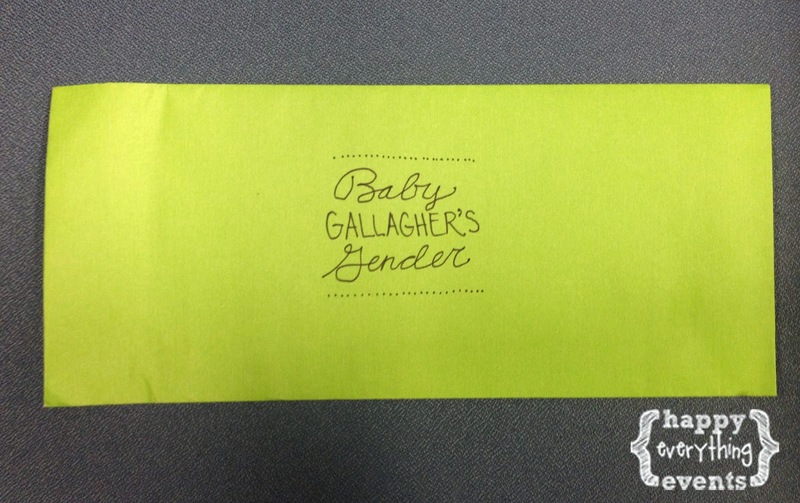 Thanks for celebrating Baby Gallagher"
and "Kiss Me, I'm Irish" gum. The talented Jo from Highway to Hill Flowers designed the gorgeous floral arrangements. 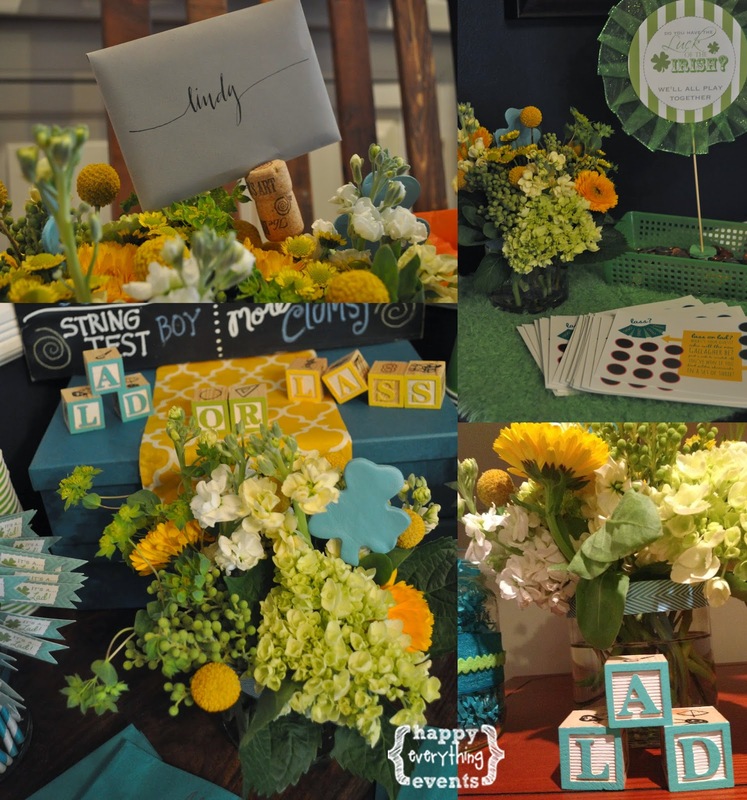 She incorporated white and green hydrangeas, yellow daisies and green Billy Balls as well as clay teal shamrocks and ribbon. They were stunning and truly stole the show. Thanks, Jo! 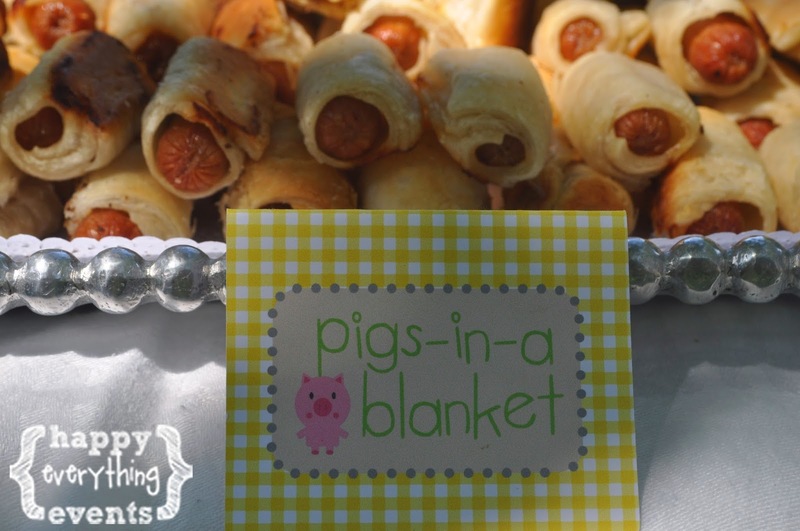 The menu included: Bangers and Grits, Reuben Sliders, Assorted Quiches (from H Street's Dangerously Delicious Pies), Mac and Cheese (from Kenny's BBQ), Bacon on a Stick, Cupcakes (from Buzz Bakery) and a few items for the Wee Ones: goldfish crackers, animal crackers and apple juice. The specialty drinks included: Irish Coffees and Midori Champagne Cocktails. Guests could continue their vote by choosing a cocktail glass with the corresponding gender color. 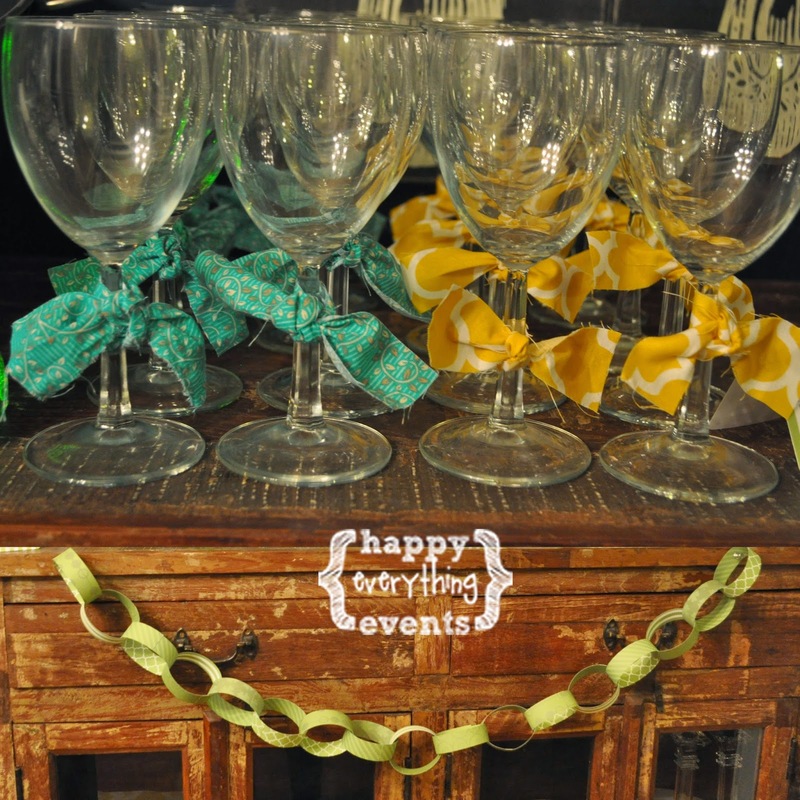 The lime green paper chain garland added the perfect vintage touch to the decor. 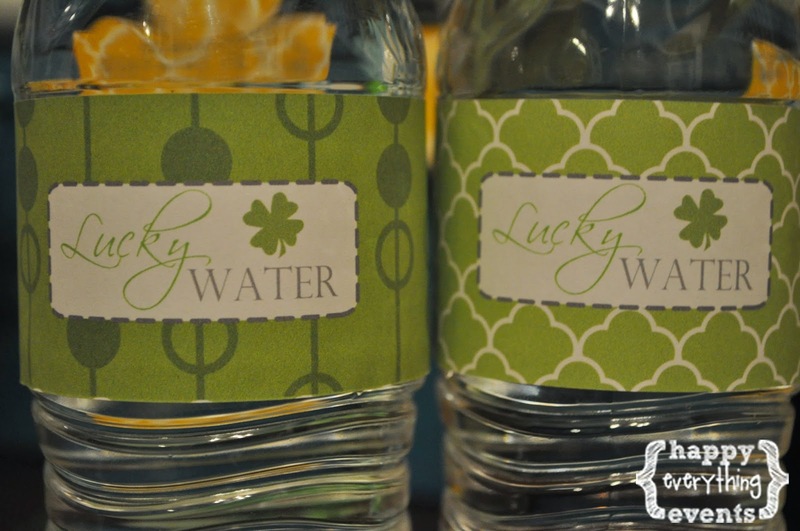 "Lucky Water" bottle labels also helped tie into the decor. Since we had kid guests, I wanted them to feel welcome, too. 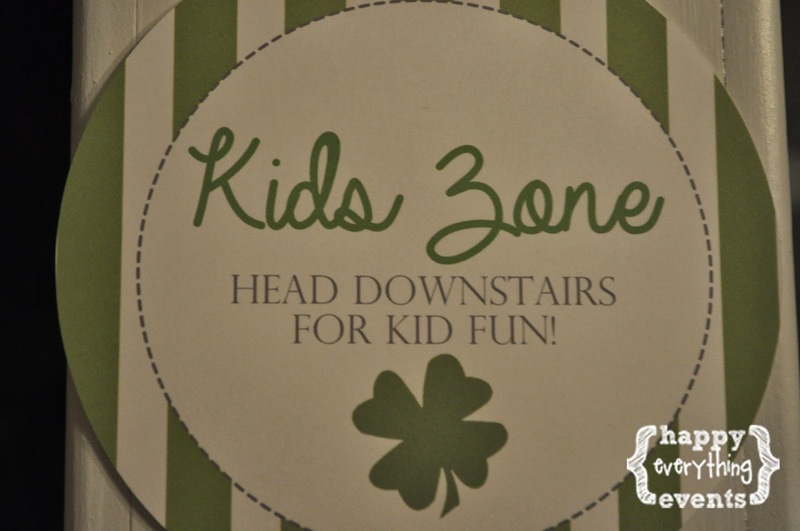 We set up the basement as the "Kids Zone," with shamrock coloring, snacks and fun TV. 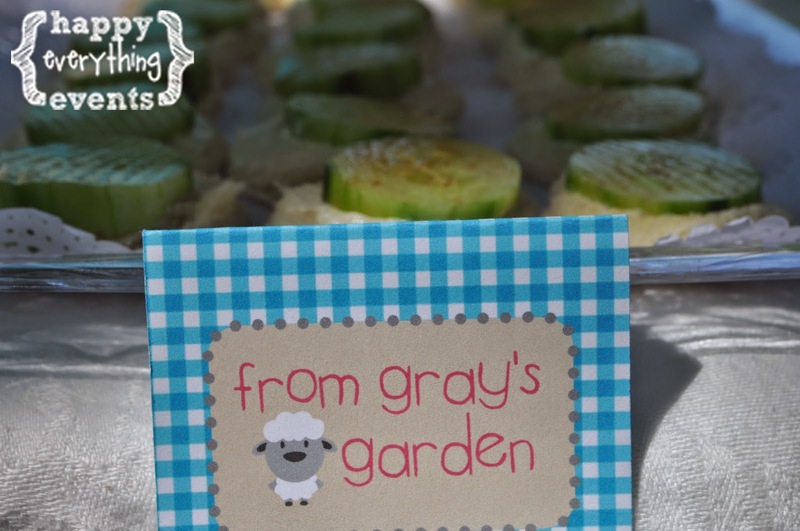 "Baby G" was featured on the green silverware wraps. 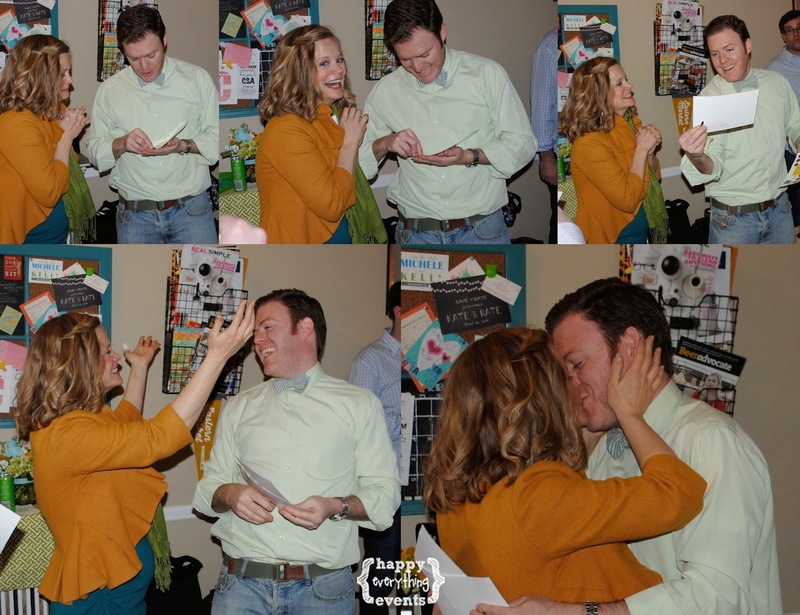 They were given a scratch-off card for the big reveal. 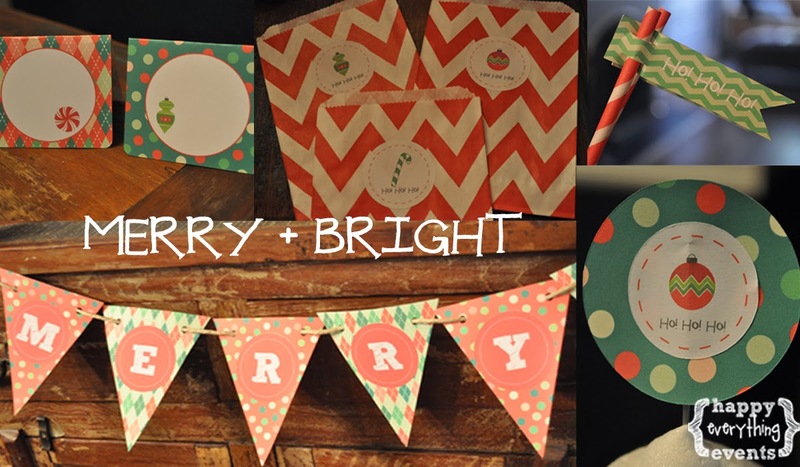 Katie from StationMerry designed these outstanding cards, which made the party even more fun and interactive. 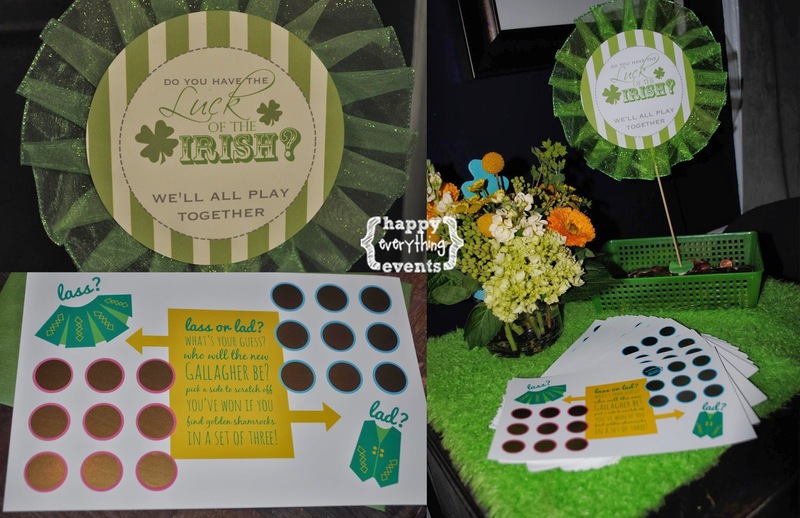 Guests were to pick a side: Lad or Lass and scratch-off to see if it had three gold clovers. To add to the fun, we had only one "winning" card at the party. So, guests had incentive to see if their card was the winner. But first, we had to Skype our family from afar so they could play along with us. And, here's the play-by-play of Jack and me discovering our baby's gender. Thanks to Grant for the winning card! 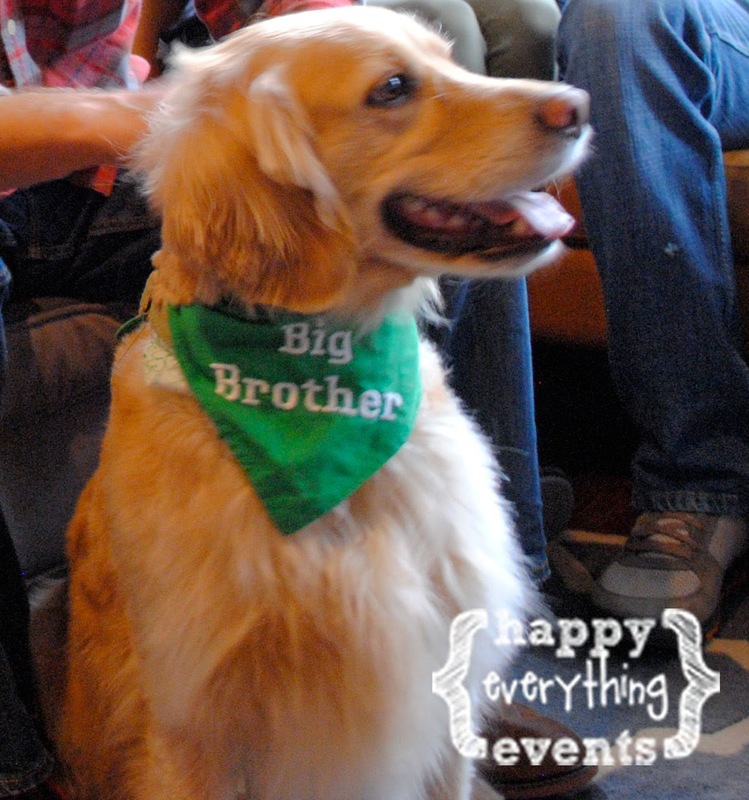 Even Big Brother Murphy was eager to hear the news! ("Big Brother" bandana created by Make Me Smile Crafts and also appeared on our Christmas Card Pregnancy Announcements). 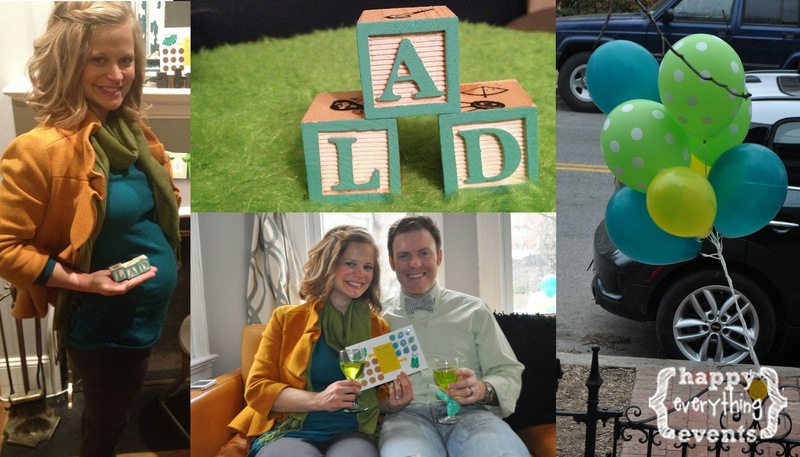 Needless to say, Jack was pretty thrilled that "Lad" was the gender! We spent the remainder of the day glowing from the excitement (Who am I kidding? We are still beaming from the news). To say we are "lucky" doesn't quite sum it up. "Blessed" is more like it. Thank you to our family and friends for participating in our special day. We are so blessed to have you all in our lives as we embark on this exciting adventure of parenthood! 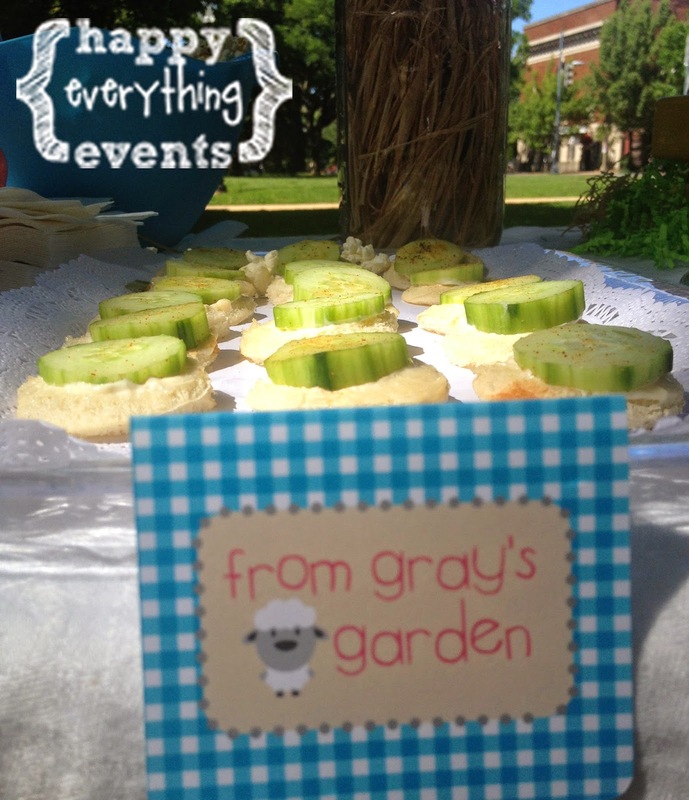 This party would not have been possible without the help of these outstanding vendors. Thank you! "Lucky" by my ridiculously talented friend Kat Edmonson. (If you didn't click on this at the beginning at the post, do so now. You won't regret it)! Interested in a similar party? Let me know!